An expertly selected and arranged collection of favorite and original pieces guaranteed to motivate students. 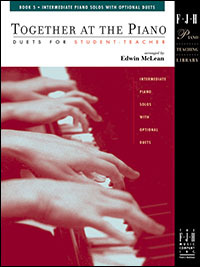 This series offers a wealth of lesson and recital material and an opportunity for student-teacher duets. This collection encompasses a variety of styles - classical, popular, folk, gospel, and original pieces - all carefully selected to appeal to younger students. This fun-filled, versatile collection features a wide array of musical styles. At this level, eighth notes and dotted quarters are introduced, along with the keys of F and G.
In Book 4 of this outstanding series, the student will encounter sixteenth notes, swing rhythm, and 6/8 time. In this appealing intermediate collection, students will encounter keys with up to two sharps or flats, and some simple syncopations.